Are you “app happy” or does the amount of time you spend online make you angry, anxious, envious or depressed? If the latter, then you’re probably spending too much time on the internet, according to research from Moment, an app that monitors and limits the amount of time users spend on Apple devices. 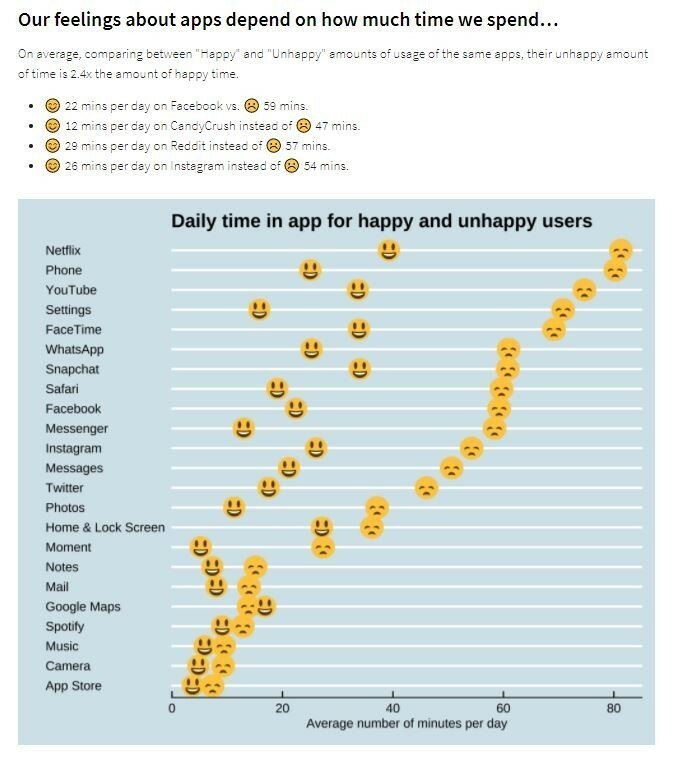 Working with the Center for Humane Technology, a group of former tech insiders concerned where the industry is leading us, Moment asked 200,000 iPhone users “are you happy with your time spent?”. Their aim was to discover which apps we consider most beneficial. Those that responded said the apps that provided the most happiness included Calm (mindfulness and meditation), Amazon Music, Audible (podcasts and audiobooks) and weather apps. 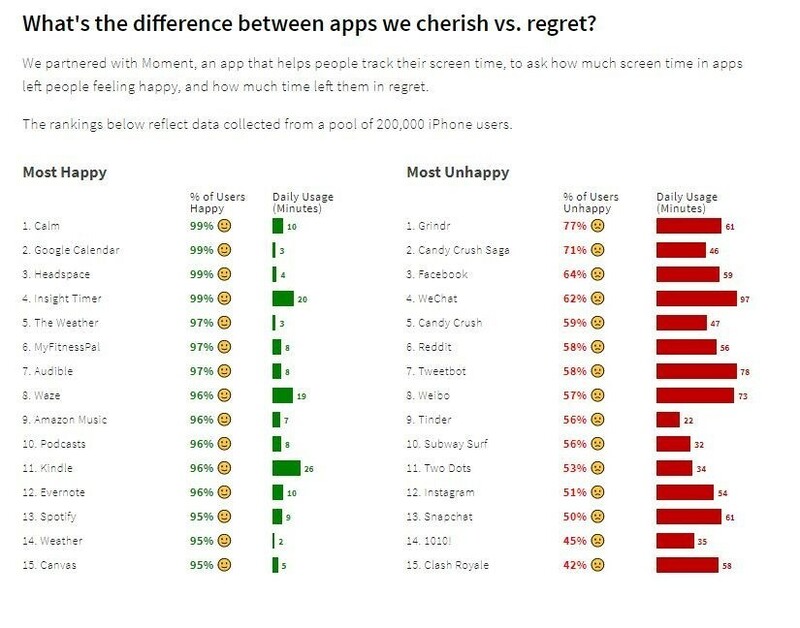 But apps including Grindr, Candy Crush Saga and Reddit featured highly among those that made people unhappy. The amount of time we spend on platforms is crucial to whether they make us feel good or not, according to Moment’s designer, Kevin Holesh. He says there is a “happiness breaking point” for each app. 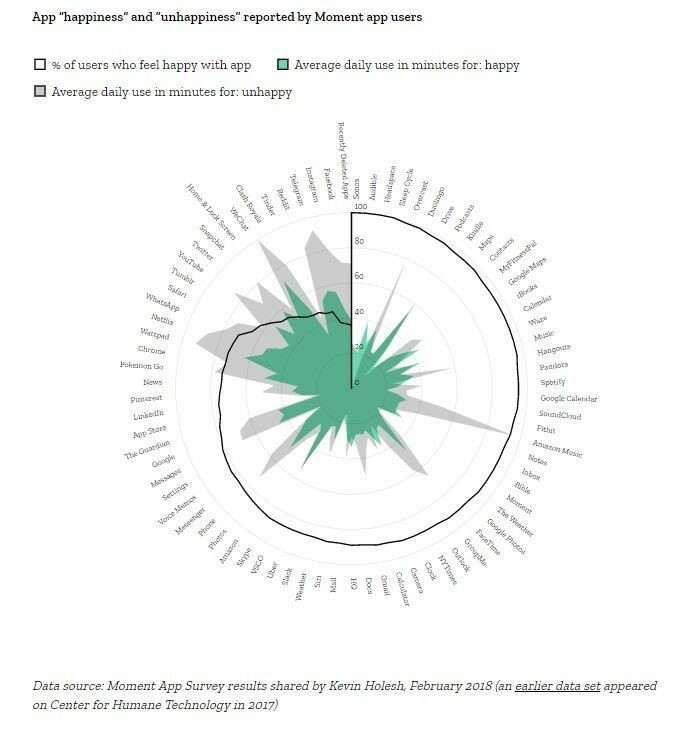 For Facebook, this equates to about 20 minutes, while the researchers said moderate usage actually boosted a user’s mood. People spending more than 40 minutes online tended to be unhappier, regardless of the apps they were using. The research chimes with other studies that indicate that too much time spent online is bad for our wellbeing and how we interact with others. A 2013 Chinese study, for example, found that users of Weibo found it easier to express anger than joy or sadness. In a world in which people are increasingly online and on devices, finding ways to moderate our use may be the key to greater happiness.